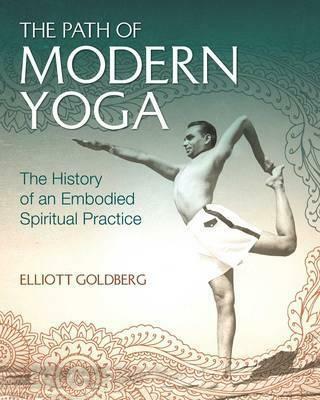 In The Path of Modern Yoga, Elliott Goldberg shows how yoga was transformed from a sacred practice into a health and fitness regime for middle-class Indians in the early 20th century and then gradually transformed over the course of the 20th century into an embodied spiritual practice–a yoga for our times. Drawing on more than 10 years of research from rare primary sources as well as recent scholarship, Goldberg tells the sweeping story of modern yoga through the remarkable lives and accomplishments of 11 key figures: six Indian yogis (Sri Yogendra, Swami Kuvalayananda, S. Sundaram, T. Krishnamacharya, Swami Sivananda, and B. K. S. Iyengar), an Indian bodybuilder (K. V. Iyer), a rajah (Bhavanarao Pant Pratinidhi), an American-born journalist (Louise Morgan), an Indian diplomat (Apa Pant), and a Russian-born yogi trained in India (Indra Devi). The author places their achievements within the context of such Western trends as the physical culture movement, the commodification of exercise, militant nationalism, jazz age popular entertainment, the quest for youth and beauty, and 19th-century New Age religion. In chronicling how the transformation of yoga from sacred discipline to exercise program allowed for the creation of an embodied spiritual practice, Goldberg presents an original, authoritative, provocative, and illuminating interpretation of the history of modern yoga.